Blake's image of Adam Qadmon as the Universal Man is Albion, in whom the Four Lives, or Zoas, are united in one four-fold vision. 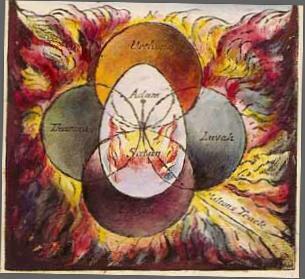 In Blake's cosmology, in Eternity (beyond space-time), Urizen/Reason in the South and Urthona/Imagination in the North are opposites, as are Tharmas/Body in the West and Luvah/Love/Passion in the East. In Man's fallen state, Passion has taken the place of Reason, with consequences for all the functions. but that doesn't mean the Body is sensation. the bound or outward circumference of Energy. Each of the Zoas have a sensation; Tharmas is the "parent power" whose sensation is the tongue; this tongue is "vegetated" and "devouring." Tharmas, the third Zoa, personifies "the principle of 'vegetative' life," and is called "the god of the waters" who resides within the realm of physical sensation (Berger 151). Initially, "his function in the eternal world is to hold the other Zoas together in the unity of Albion" (Bloom 948, 4:5-5:28). What is even more interesting is that Tharmas represents the faculty of man that "feels only the blind forces of life and growth" (Berger 130) and that has "the capacity to transform desire into actuality" (Bloom 948, 4:5-5:28). The Body is the part of the Soul that the senses can apprehend, not the senses themselves. Tharmas is the "parent power" because it provides the body -- the material, biological supports and instinctual/vegetative (growing/devouring) energies -- for the other functions. Tharmas is the "god of the waters" because that is where the biological supports for life exist -- in the world and in our bodies. The "capacity to transform desire into actuality" doesn't exactly sound like sensation either. Tharmas provides the energy for the actualization of desires (in the future of Love: see the Stoic model of impulse and assent). We are now on familar ground, with the unstructured past in the West and the indeterminate future in the East. Blake doesn't do planets, but the Sun, planet of the West in Adam Qadmon's Cube of Space, is formed by Kaf/20, the physical supports for life, and provides the unstructured energy necessary for structuration to happen. On the other hand, where do we have our in-tuitions? They are the Four Zoa's that stood around the Throne Divine! And in the South remains a burning fire; in the East a void. This leaves us with Blake's Imagination. Urizen/South and Reason is opposed to Urthona/North and Imagination, just as Kant opposed Understanding to Imagination and word to image. But Imagination, especially in Blake's use as a link to the supra-mundane, doesn't seem to fit sensation either. The problem with typologies, even with simple four-function typologies, is a definition of terms. We have already seen how sensation fell into intuition through a lack clarity. One central problem is the confusion of senses with sensation. Sensation is the function that is in touch with reality. It functions mostly and usually unconsciously, using pre-programmed neurological modules located outside the realm of cognitive function to acquire images of reality. The senses, on the other hand, are different windows into that raw stream of experience. The window is not the view. None of the other functions can kill you. Or take you to heaven. Just as the Body has two energies, vegetative and devouring, Imagination functions at the border between two realities: inner and outer. We can have "sensations" of both the inner and outer worlds, the former called Imagination and the latter called Sensation. But we know that sensation is based on image-processing, and the kind of imagination that Blake is talking about is sensual. Venus, the fallen Bright and Morning Star, at Adam Qadmon's West, is spelled Nogah, Noun-Waw-Gimel-Hay and describes two lives, one inner (Hay/5) and one outer (Noun/50, functionally linked and proliferating. The two qualities of Venus are Hhan and K'ior, grace (unstructured, indeterminate) and images/mirages (packages of light/real probability fertilizing the universal container). Imagination is the faculty for the apprehension of inner and outer life and the gateway to both material and spiritual reality. In the Cube of Space, the tenth sephirot is in the West, on the Left, from Adam Kadmon's (not fallen man's, which is reversed) perspective. This is the Sephira of Yod, Existence, and the Kingdom of God. Liberation in four-fold vision reunites the Male and Female in a Bow of Mercy whose children are the quiver and arrows of love, and restores Luvah to the East. The Universal Father. Then Albion stretchd his hand into Infinitude. Urthona Northward in thick storms a Bow of Iron terrible thundering. In the midst of his Twenty-eight Cities each with his Bow breathing. The four cardinal points are associated with the four Zoas: the north is associated with Los/Urthona, the south with Urizen, the east with Luvah/Orc, and the west with Tharmas. This configuration constitutes the basis for Blake's finite geography and depicts the perspective within Ulro. From "Great Eternity" the "Four Points" have other dimensions: the north is associated with the nadir, the south with the zenith, the east with the centre, and the west with the circumference. This configuration constitutes the basis for Blake's infinite or ideal geography and depicts the perspective of those without Ulro. It is essential to bear in mind that the two sets, within and without Ulro, operate simultaneously. The Nadir: East, the Center, unapproachable for ever. In every Man. Ezekiel saw them by Chebars flood. And the Eyes are the South, and the Nostrils are the East. And the Tongue is the West, and the Ear is the North.